I love St. Patrick’s Day or St. Paddy’s Day (but never St. Patty’s Day! ), the annual celebration of all things Irish. Irish or not it’s all about having a great time and I’m absolutely on-board with that. My grandfather on my mom’s side was part Irish so I’m legitimate but not that I need an excuse; don’t we all think we’re a tiny bit Irish on St. Patrick’s Day? Maybe that’s why the only beer I enjoy is Guinness? Although I still lean way more towards cocktails made with coffee, Irish Whiskey, and Bailey’s and in the case of this cocktail today? How about all three? Not wanting to be redundant of things I’ve created in the past, I decided to throw in some Frangelico hazelnut liqueur and bring a bit of Italy into the mix; how could that ever be bad? Want to get into the spirit with me? If you think St. Patrick’s Day is just another one of those days that was elevated only in America; think again. I love this video of a parade held in the streets of Dublin; while Denver has an annual St. Patrick’s Day Parade downtown, trust me, it doesn’t even begin to compare. 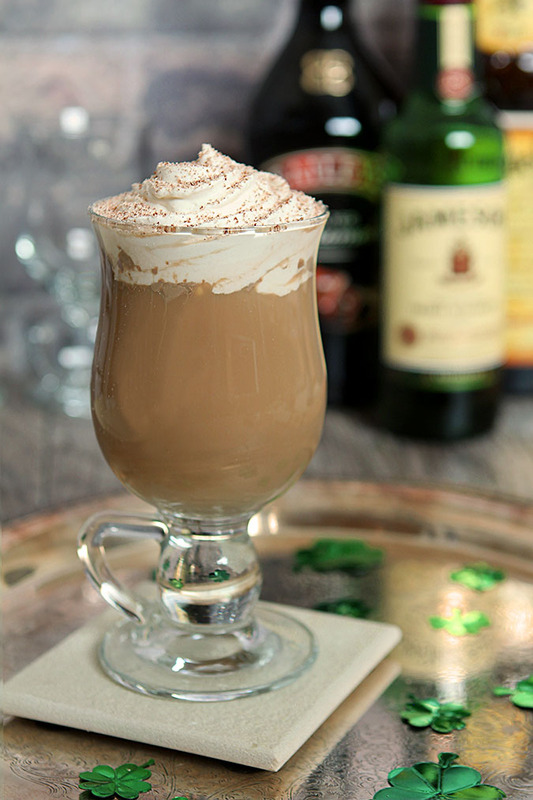 I decided instead to make this cocktail; a play on an Irish Coffee which is a combination of strong coffee and Jameson Irish Whiskey topped with whipped cream. 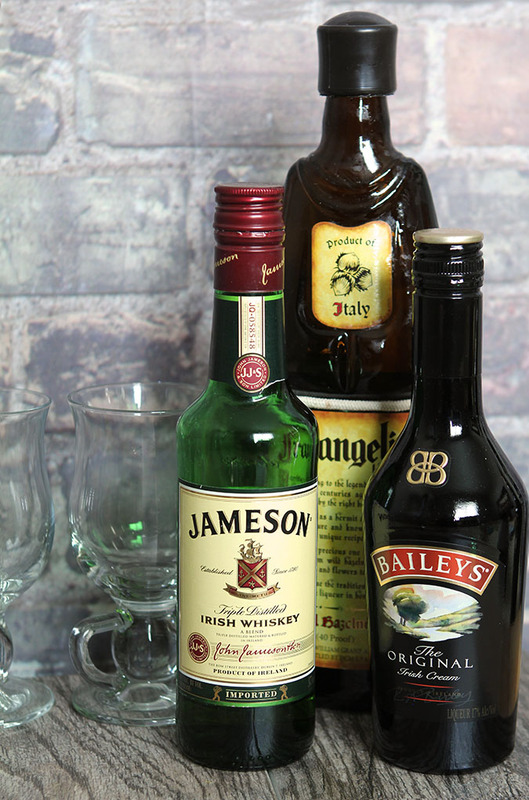 Of course you could use any Irish Whiskey but Jameson is an iconic brand and I think perfect for this cocktail. There are stronger and probably even better Irish whiskeys but those are more suitable for sipping; I think Jameson perfect for either baking or cocktail making. 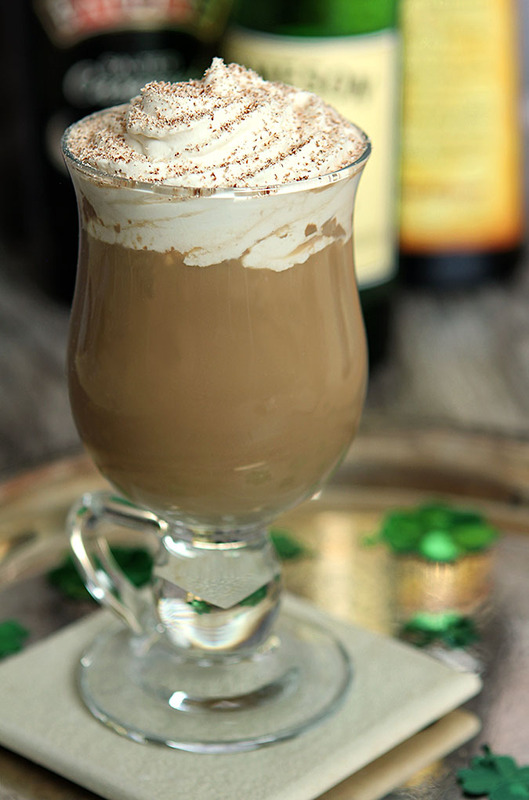 I know of no good substitute for Bailey’s which is an Irish Whiskey and Cream liqueur. I’ve made my own but it does have a short shelf life so unless I’m making a batch to give away for holiday gifts, I actually prefer buying a small bottle of Bailey’s when the need arises. Frangelico hazelnut liqueur is the wild card of this bunch, hailing from Italy and it’s one of my favorites. Made from Tonda Gentile hazelnuts that are grown in an area of rural hills and picturesque villages in the southern Piedmont of Italy; they are known for being bigger, plumper and more uniform with a skin that sheds easily, making them perfect for toasting without leaving a bitter taste. Once toasted and distilled with alcohol, the hazelnuts are combined with other flavors including cocoa, coffee and vanilla according to a secret recipe and transformed into Frangelico. If you’re in the mood for more than just a cocktail; one of my favorites is this Cabbage and Bacon Colcannon with Irish Whiskey Steak; it is a huge favorite. Cabbage in mashed potatoes? Don’t knock it until you’ve tried it; it is so good and of course the bacon doesn’t hurt the cause one tiny bit! For dessert each year I don’t get too adventurous; we simply love this ‘Irish Coffee’ Cake. Not to be confused with a breakfast treat; this cake has both coffee and Irish Whiskey; you know, those components of an Irish Coffee? Hence the moniker and it’s quite simply the perfect sweet ending to a meal with Corned Beef, Shepherd’s Pie or the aforementioned Colcannon. I might have to make all three! Warm your coffee mugs by pouring some hot water into them and letting them sit for a minute before filling them with the cocktail. Fill with the coffee and stir well. Top with the whipped cream and dust with ground nutmeg. I’m part Irish and all nutty, so obviously you made this for me. 🙂 Fun drink — thanks.